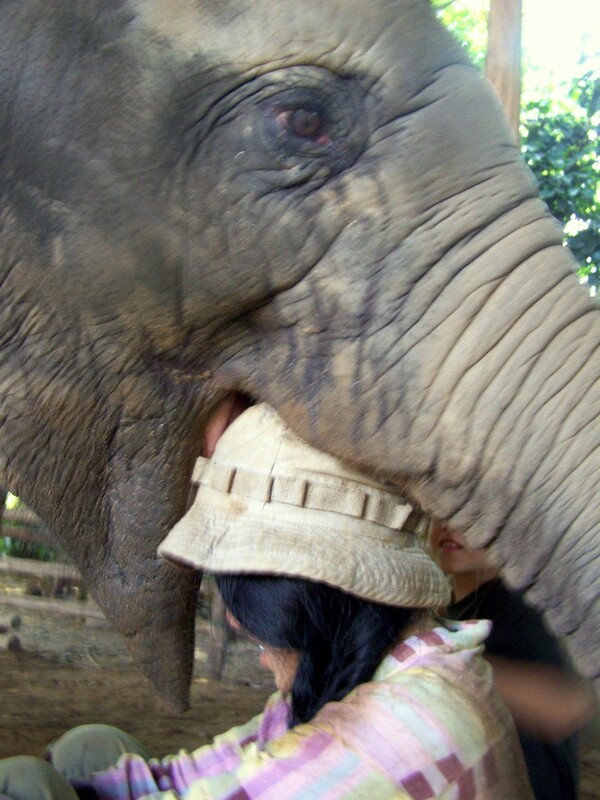 Lek accepts a playful smooch from Faa Mai's trunk. “Que sera sera, whatever will be, will be. 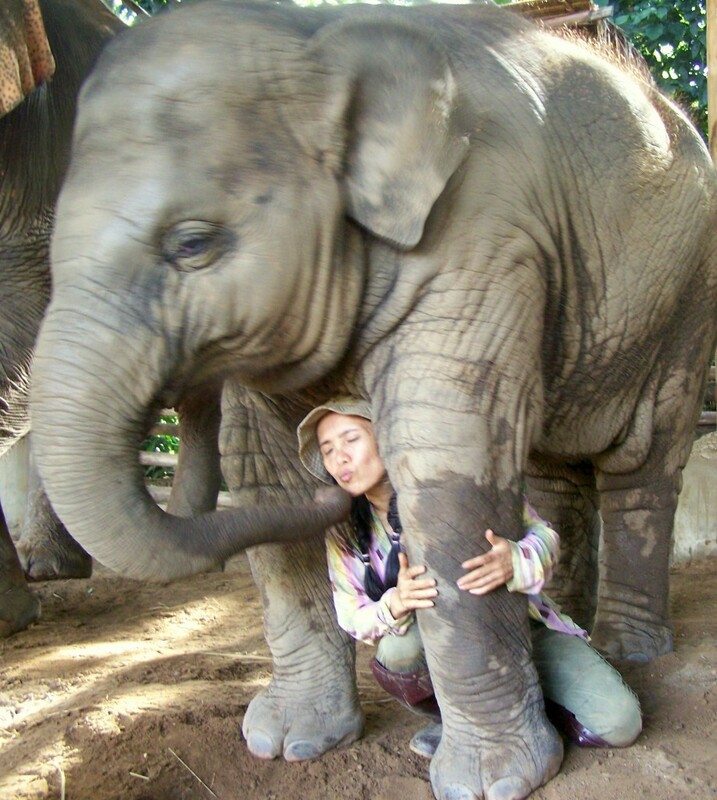 The future is ours, you’ll see, que sera sera,” Lek sings softly to the baby elephant, Faa Mai, as she sits on the dirt between the animal’s front legs. I watch, silently, in awe. Lek singing to her is a beautiful moment between friends. 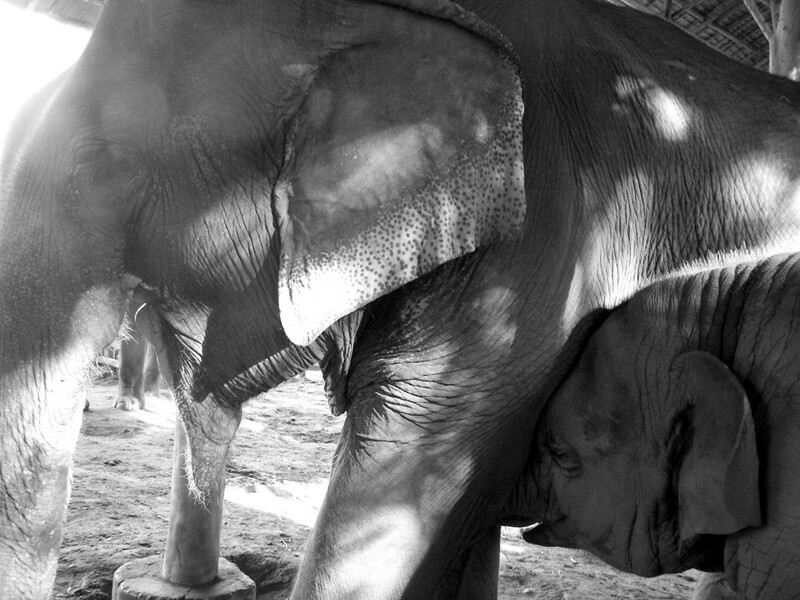 To me, someone who has spent nearly a week as a volunteer with elephants at Elephant Nature Park, it’s poetic and serves to further illustrate the struggles of the elephant in Thailand and Lek’s role in saving their future. I smile to myself as she sits on the soft ground, gently stroking the gray legs of Faa Mai. After a moment, Lek’s not alone on the ground anymore. In front of her, under the trunk of the baby, is one of the volutneers. An eight-year-old boy who’s been noticeably absent from most of the volunteer tasks but extremely present in this moment. He looks petrified, even though Lek’s reassuring arm is wrapped tightly around him, as she watches the family that has now gathered around them under the thatched roof shelter. It’s Faa Mai’s naptime, and when Lek is at the park and able to, she heads to the family shelter to spend time with the baby, singing her softly to sleep. The previous day, she treated all of the volunteers to a special moment with her and the baby, ushering each of us, one-by-one, to sit with her on the ground as she sang. Today, it’s the boy, his dad, and somehow, me. I came across the three of them en route to my room after spending time with the vet. The family shelter is just next to my modest quarters, and as I walk past the shelter, I spot the three of them inside the roofed area. The boy’s dad stands off to the side as Lek and his son sit together, surrounded by elephants. I stand on the other side of the knobby wooden bars, resting my head against one of them, mesmerized by the founder’s connection with this elephant. No matter how many times I watch her interact with these creatures, I can’t help but marvel at the bond she has with them. It’s special. It’s beautiful. It’s amazing. 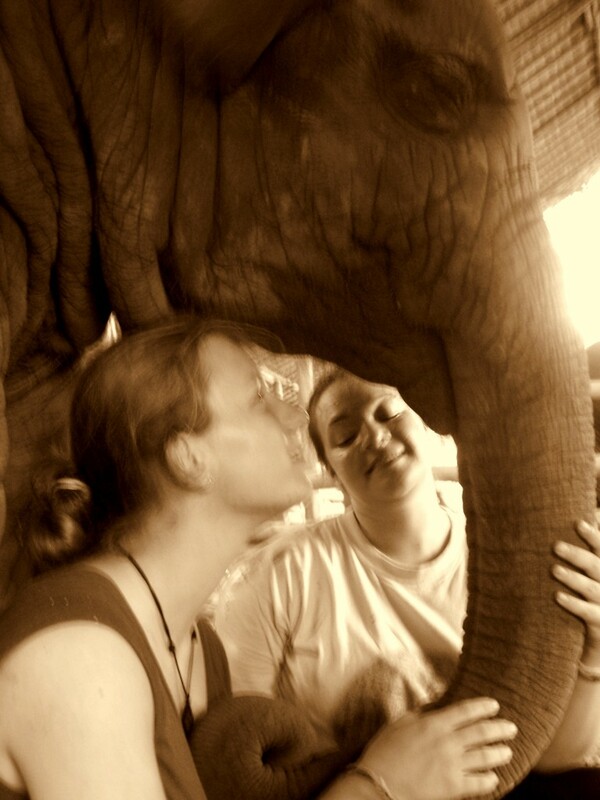 “D, you can come in, too,” she says, gesturing with her free arm to come into the shelter and hang out with the three of them … and a handful of elephants. I hang to the side at first, letting the boy and Lek have time together. I feel so fortunate for the time I had the previous day, I don’t dare impose on this moment they are sharing. The dad and I watch as the elephants gather around the baby and the two humans on the ground. It’s intimidating. Huge legs, capable of shattering bones, all around. And yet, they don’t even get near the people. They keep their distance, as if they know their own power. I get a sense that so long as Lek is in the shelter with us, we won’t be harmed. They know and trust Lek. “You can come here,” she says to me, once again motioning for me to come closer. This time, it’s to sit on the ground next to the baby. Then, it’s the three of us. 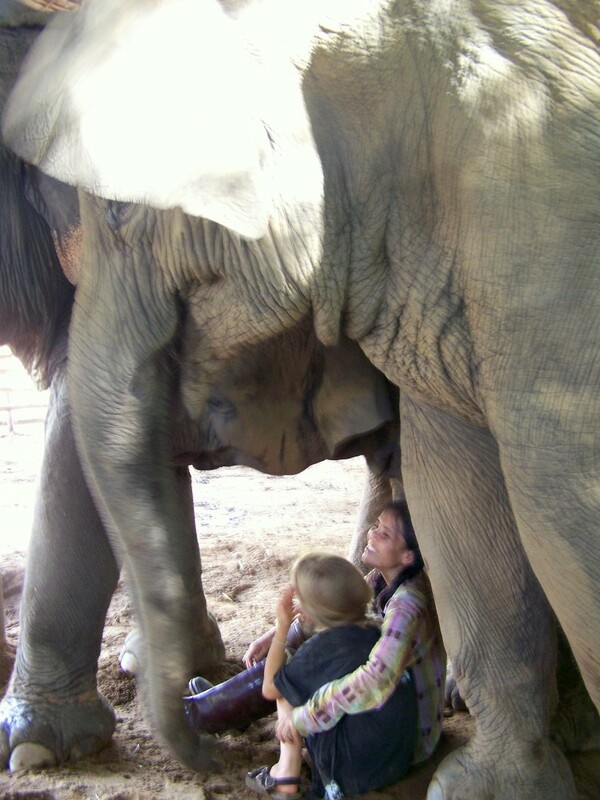 The child under the trunk of the elephant, me stationed at Faa Mai’s side, and Lek under the front legs. 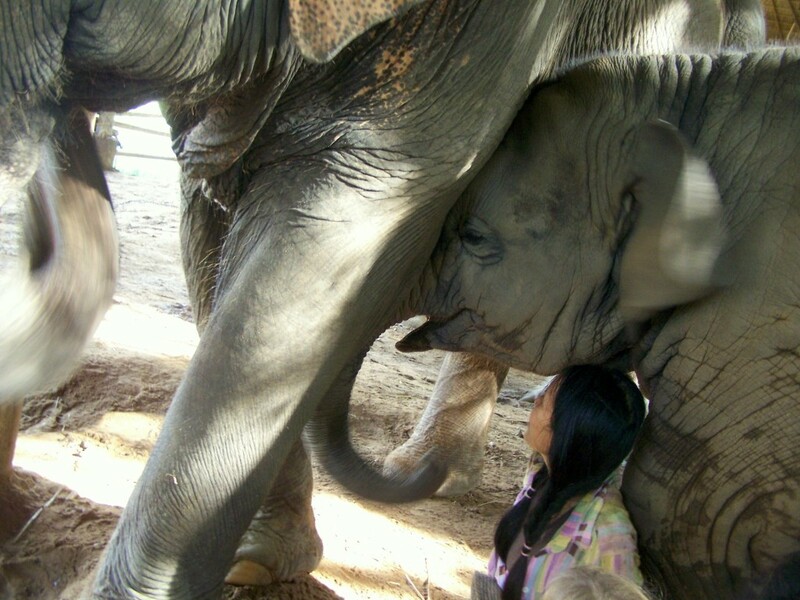 She signs softly again and then speaks to her in Thai, reaching out to touch the leathery trunk and pushing it towards her mom who stands in front of us. “She needs to nurse,” Lek explains as Faa Mai’s trunk searches for Mae Bua Tong’s teat. For a few minutes, the two-year-old nurses as we sit and observe. Then, I spot Evelyn, another volunteer, who has come up to watch. She stands like I did, on the other side of the fence, watching us. “Come, come,” Lek says to her, and then the blonde Austrian girl comes and sits with us, too. When Faa Mai finishes nursing, Evelyn takes the boy’s place under the massive head of the baby and Lek begins to sing, once again. Sitting with Faa Mai as she sleeps. “Put your hand out so she can rest her trunk in it when she sleeps,” Lek instructs Evelyn. Within moments, Faa Mai (along with us), is under the spell of Lek’s lullaby, and has relaxed. Her big-lashed eyes flutter closed and her trunk hangs, curling at the bottom in Evelyn’s hand. Ever now and then, she puffs. She’s sleeping. Standing up. As we sit at her feet. I rest my head on her trunk, running my hand down the length of it, taking in the moment. The baby elephant sleeping at my side. Lek’s soft, sweet song quietly goes on in the background as I stare at Faa Mai. Every now and then, Faa Mai opens her eyes and looks around, and then closes them again. I’m sitting here with the elephant family towering over me. They let us sit with the baby of the family without pause. “This is one of the most amazing moments of my life,” I whisper to no one in particular. I just want it put out into the world. In fact, the past 24-hours I have spent at Elephant Nature Park, have been possibly the most amazing experience of my life. First, being a part of the herd and spending an afternoon with Lek. Now, sitting with Lek and keeping company with the baby as she drifts in and out of sleep. When Faa Mai wakes up a few minutes later, she’s playful, opening her mouth and carefully placing Lek’s head in it. Lek laughs and tells her “no” as her hat almost dislodges. 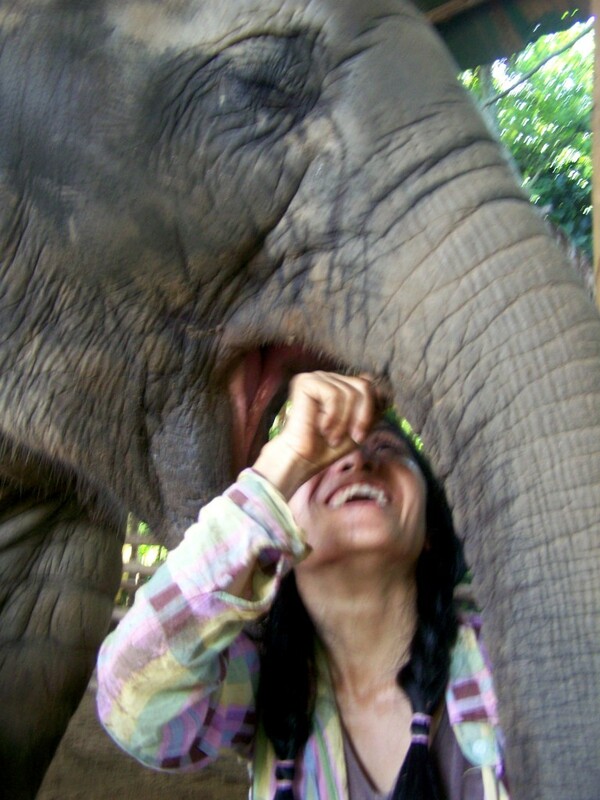 Then, she sticks a finger in the roof of Faa Mai’s mouth and tickles it. If Faa Mai could giggle, I’m pretty sure she would. Her eyes sparkle as she stands there, letting Lek get a good scratch in. I walk back to my room, to the shower, giddy. Humming “Que Sera Sera” on repeat the entire evening. I’m on Cloud Nine until the next morning, when all of the elation from the previous day is eclipsed. And, my heart, which had thumped so happily, now nearly breaks thanks to the truth of why we’re here — to care for elephants who have been a part of the elephant tourism industry and now have a chance to live the rest of their lives free from abuse. There’s a sick elephant. A very sick elephant. What a beautiful post D! I’m so happy you experienced all this!! I can truly imagine it and it sounds so wonderful!!! Thanks for sharing all these posts!!! My god is this beautifully written! What an unforgettable moment!!! Aww, thank you, Andi!! 🙂 It was an unforgettable moment! unbelievably amazing experience… thanks for sharing! Thank you!! It was a truly unbelievable experience! Wow what an incredible story Diana. Really impressive that you can find a way to describe the experience, so that we can feel how special it was for you. This is so heartfelt! How amazing that you will remember that moment every time you hear the song in the future. Lovely D.
What a well written post! I felt as if I was there with you in person! It is indeed a heartfelt story. Thanks, Shirlene! I’m glad you were able to feel like you were there. It definitely came from my heart. What a lovely story. Incredible photos, too. Thank you, Sophie. I appreciate it! I’m sad that there needs to be a sanctuary, but glad you got to experience such a wonderful moment there. So touching. Thank you! I am glad I was able to experience it. I count my lucky stars every day for that week of my life. These elephant stories keep getting more and more incredible. Wow. I don’t know what else to say but wow. Incredible story! I am in awe at all these elephant stories. Thank you! I think the next place you should bike is Thailand … straight up to Elephant Nature Park! What a beautiful moment. I can’t imagine getting to cuddle a baby elephant! It was really cool. Although while she may still classify as a “baby” she stood about as tall as me! Yes, and yes. 🙂 Quite the experience! Aww what a sweet post. It’s mind-blowing to think of singing lullabies to such an enormous creature. It was absolutely mind-blowing to be there, on the ground, with her, and watching her big eyes slowly flutter shut. Amazing!! Yay!! You just made my day!! First, thank you for taking the time to read the series!! Each and every post came from the bottom of my heart, so it thrills me to know they impacted you. Definitely spend time at the park. It costs about $400USD for a week, but it worth every single penny. I plan on going back there, too!! Keep me updated! What an incredible experience! 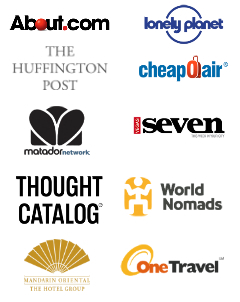 I would love to volunteer and see all of the many beautiful places of the world. Great post! It was up there as one of the all-time greatest moments of my life!! Hi Diane, When did you got to ENP? 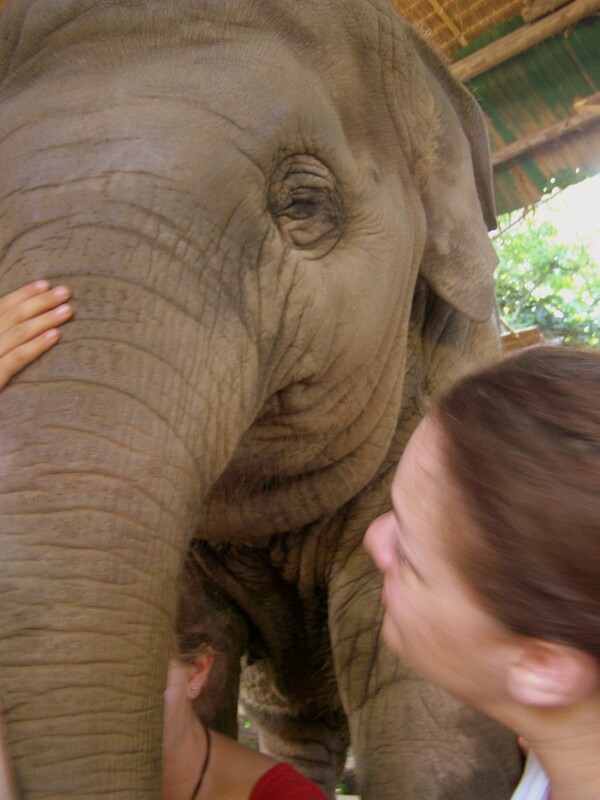 I have just read all your ele posts and you have moved me to tears! They are beautifully written and really capture the essence of the place. I went in 2008 and still think of it every day! I cannot believe what is going on there at the moment. Charlie, your comment means a lot to me. Thank you so much. It is terrible what is taking place there right now, and I hope it all works out and we are able to continue to enjoy the park and what it does. I went to ENP this past September and, as you probably can tell, it changed my life. I am absolutely tickled you think my writing captures the essence of the place. There are not many places that truly touch my soul the way ENP did, and I wanted to be able to share that feeling with readers. awesom! it must’ve been a very unique experience Diana, keep having fun! Another great story Diana. Seriously excellent work! Great story.Your time with the baby elephant seems absolutely blissful. I hope we get the chance to work with these amazing creatures one day. Thank you! It was such an amazing experience to sit with her and listen to Lek sing. I cannot wait to go back. You should definitely come out and spend some time with them.